This tutorial is only for beginners of the app! There are many kind of messengers that people use on phones and tablets. WhatsApp is one of popular applications at many countries at the moment. If you are new on this application and if you don’t know how to use it, you will find a guide here for beginning to chat with people. We are going to give you step by step information below. You will learn how to start a new chat and how to send a message to someone on Android and iOS. We hope that it will be useful for you. We will begin with Android, please scroll down to see guideline for iOS. Run WhatsApp on your Android phone or tablet. Tap on chat bubble which is located top bottom of the application. All your contacts (who are using WhatsApp messenger) will appear on the screen now. Tap one of those contacts to begin to chat. You have selected your contact as we have mentioned above and you are ready to chat with him/her. You need to do following for sending him/her message. Tap on chat box at the bottom of the chat screen. There is already a text in that chat box “Type Message”. Android keyboard will appear when you click on there. Type your message with the keyboard. When you are done tap on green arrow button. You are done. When your friend received the message, he/she is going to respond you. (If there is not a problem with internet connection). 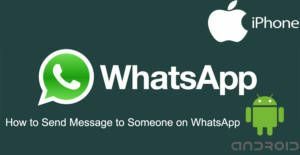 Run WhatsApp on your iPad or iPhone device. At the top right of the application, you will see this button: . 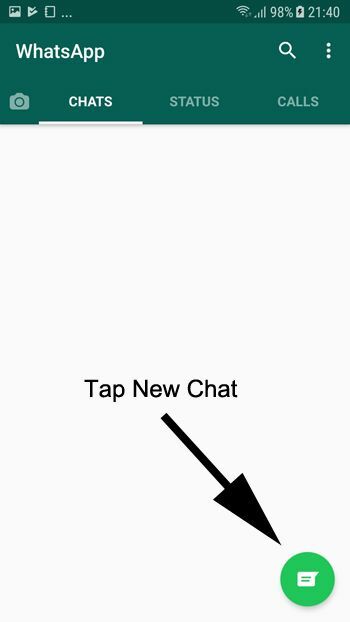 Please tap on this button to start a new chat. Select one of your contacts to begin to chat. You have started to a chat with one of your contacts with guide above and you need to message him/her now. Do the following. Tap on the chat box. Type your message to your friend. Tap on blue arrow to send the message.